A training ground for up and coming tennis juniors, TCCP is nestled near the University of Maryland Campus at College Park. Such greats as Denis Kudla and Mitchell Frank have been past alumni in this unique institution. It is not your typical Bollettieri-styled boot camp - rather it has a much more family and education oriented structure to its program. Tennis Channel had featured some of the coaches on its special called "Who's Next?" 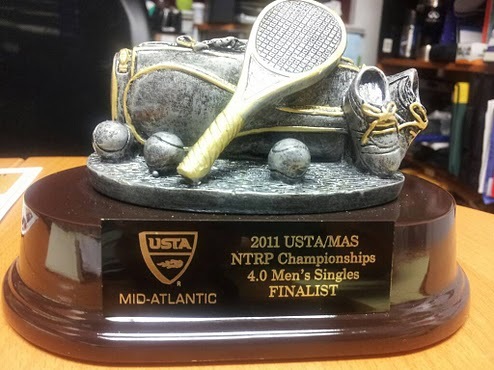 It houses 12 indoor and 15 outdoor courts, including Deco-Turf 2, Har-Tru green clay and the only 2 French Open-style red clay courts in the Mid-Atlantic. Here is a Washington Post article with pictures of the facilities. During the July 4th weekend, I entered the USTA Mid-Atlantic Championship Tournament. Played across 4 days with heat indices reaching over 100 degrees, some competitors who entered multiple events had to retire. I was blessed with a favorable draw and received a 1st round bye during Friday night. Some of the 1st round matches lasted so long that they had to be moved indoors that night. The tennis gods must have taken pity on me, as I was able to play 3 consecutive rounds indoors. The bubble, etched with red Terrapin logos, was much more humid but at least it was shelter from the relentless sun outside. My semi-finals victory could partially be attributed to this fact that I was the fresher man the day before. One characteristic of the tennis bubble I had to become accustomed was the concave sides caused out balls and most errant serves to rebound back on court. Acoustically, there is a hollow echo that reverberates the grunts and yells inside like a giant cave. The lighting was a bit dimmer than I expected, but I liked the surface and bounce height. I never lost a set indoors the entire tournament. I had a good sense of what I was up against, as my fellow USTA teammate had fought valiantly the day before to my opponent. I watch how consistently well his slice backhand seemed to frustrate my friend even in the great condition he was in. The final was just as tough as I had imagined. We were assigned outdoor court #21 - blackjack, the farthest court at the end. I had watched another friend's doubles match here just a day earlier. What I did not realize was that the court surface was slick and smoothed out near the back of the baseline - almost as if there was a fine film of dirt. Traction was a problem on a few occasions but more frustrating was my inability to attack the 2nd serve, which was plainly vulnerable but I would over-hit or mis-time too many times that day. I lost the first set too easily, and hunkered down in the second. The cross court rallies seemed to last forever, especially on the backhand side. When I pressed, he would defend stubbornly - no free points. If I had any chance, it would be to wear him down and take out his legs. I was successful to a degree, but the cost was that I also was expending a lot of energy to keep him moving. In my final service game, my energy level was a bit lower than I had anticipated and ended up dropping it along with the match 6-2, 6-4. He came up to the net during a few key plays but for whatever reason, my lob was not calibrated...sailing just a few inches long each time, whereas the day before it was making its mark almost like clockwork. In retrospect, I have to fault myself for leaving my rackets in the car the day before...going out to lunch for a couple hours just to wind down. It is possible this would have loosen the strings just enough, given that it was probably 120+ degrees in my trunk - dumb mistake. In the end, I was happy with my performance for the tournament overall. It was a fun event because of all the company I had there, plenty of nice amenities at the club, and the familiar faces at the event made it all much less stressful. Of course there were the usual "competitive" line calls and players that seem to have their lives riding on the results, but that's to be expected. It was nice to be able to sneak a peek between rounds to watch the Wimbledon championship weekend playing on the large HDTV out front, showcasing the finals for both the men and women players. It is always nice to bring some hardware back home in any case too. I'm looking forward to being back there again next year.